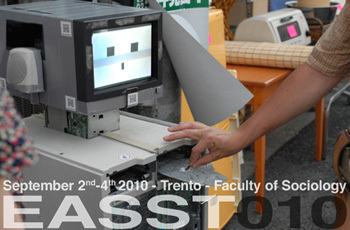 The EASST_010 conference is the biennial forum of the European Association for the Study of Science and Technology (EASST) for contributions on topics from the range of disciplines found within science, technology and innovation studies. The particular focus for the 2010 conference is that of practice and performance. Science and technology, are seen as performative domains of the “social”, situated practices rooted and grown in a sociomaterial context. If a key characteristic of the contemporary world is the role played by scientific knowledge and technological artefacts in the production and reproduction of the sociomaterial configuration which is often called “society”, then the concepts of practice and performance enable a unique perspective for studying and observing scientific and technological innovations, as well as the articulation of different forms of sociality and ideas of the social. THE CONFERENCE PROGRAMME IS ONLINE.